Benjamin Oswald may not be a household name yet, but chances are you've admired his work and held it in your hands. In addition to other sculptural pieces, the Edmonton-based ceramicist is the creator of beautiful hand-thrown porcelain vases with a blue-grey interior glaze. 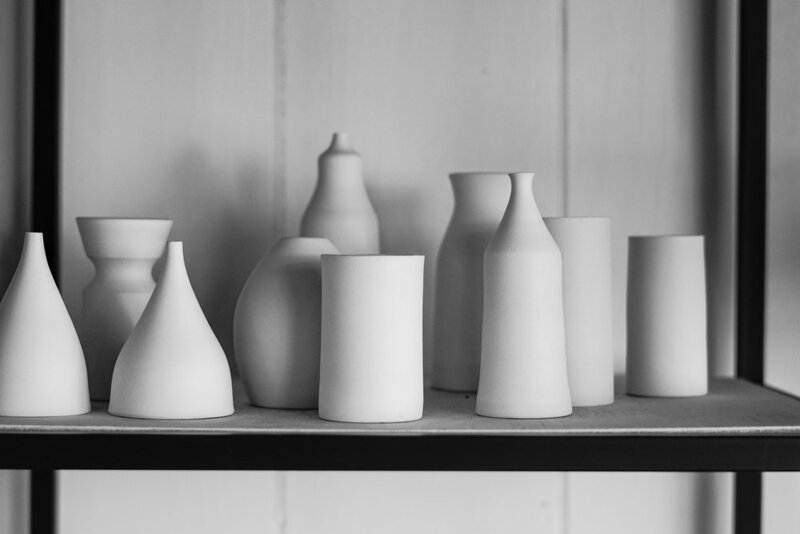 His work can be found in the Edmonton Made Gift Guide and his petite vessels are shop favourites at Maven & Grace. In fact, we love them so much that we approached Ben to create a bespoke glaze. Lucky for us, he accepted with enthusiasm, and we collaborated on not just one, but two of the loveliest shades! 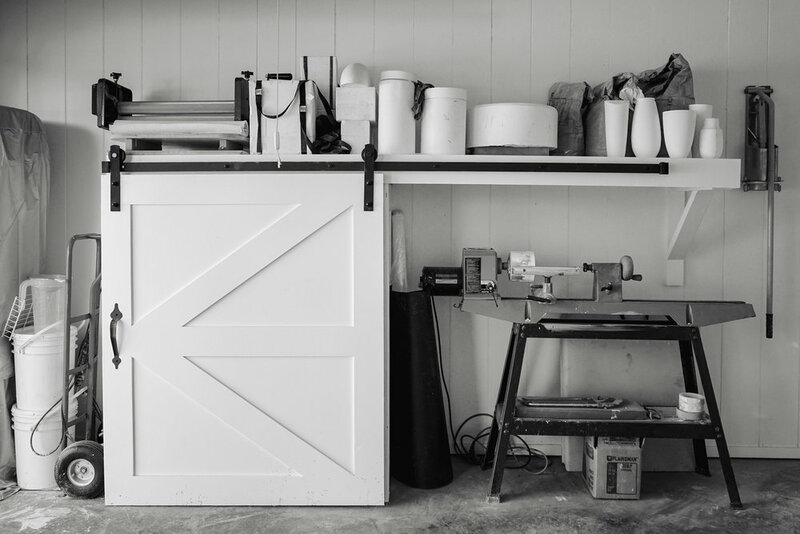 Before we share a sneak peek of the vases, we invite you into Ben's backyard studio. Last Fall we had the pleasure of touring Ben and Suzanne Oswald's home, featured in Design Majeur in November 2017. 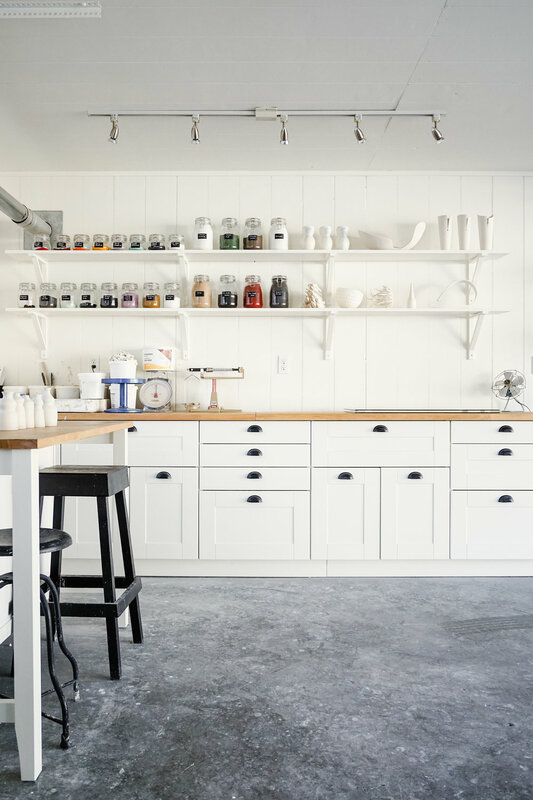 Today we're inviting you into Ben's inspiring garage studio where the white-washed walls are flooded with light, jars of powdered pigments share the shelves with pieces in various stages of production, and the pottery wheel and kiln hold pride of place. It's a space that evokes calm and potential, and it's every bit as functional as it is lovely. What inspired you to build a studio in your garage? I've always wanted to have a place to retreat and work and I started off in stone sculpture so it actually created quite a dusty, rubbly mess. I exhibited stone sculpture for years and then about 10 years ago I started to teach ceramics. It became a love affair with ceramic material and eventually predominantly porcelain. I truly needed the space. How did you convert the garage to fit your artistic needs? We did a full renovation of the garage space last year where we completely gutted it. We put in barn doors to hide the air compressor, an attic ladder and converted it into a full studio where I could bring clients. Suzanne was much of the architect for that. 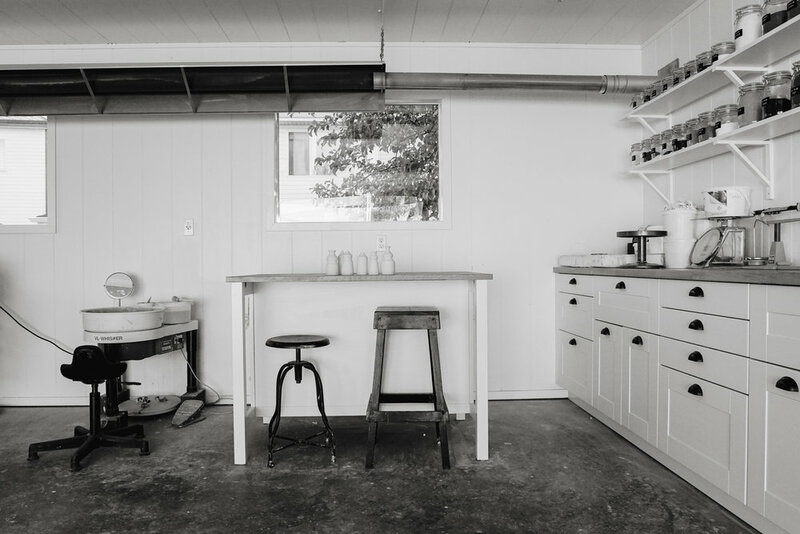 Ultimately we framed the inside of the garage with ranch wall, and when you go into the studio space you see a full IKEA kitchen where I keep all my tools. There had been so much stuff that it had been quite distracting. Suzanne was a tremendous help in that part because she said 'babe, you just gotta throw this stuff away’. Do you find having all that space inspiring? Oh yes, and I can still make it messy. It's clay, it's so messy. It gets everywhere. It's great - it keeps me thinking and working. The studio is functional enough that I can complete my routine of ceramic work and still experiment with new ideas and techniques. We thank the Oswalds for opening their space to us. We're thrilled to reveal these stunning new pieces, exclusive to Maven & Grace! At the end of winter we find ourselves dreaming of escape. Grey days have us wishing we could hop a plane and explore the globe. To ease our yearning for travels, we're sharing our first home tour of 2018, a house designed with pieces from around the world. When you walk into Jenn's house, it's impossible to overlook the wealth of colours. In a design world where white walls are ever present, it's so refreshing to see a vibrant palette. "When we first moved in, the whole house had dingy white walls and was really in need of paint - so we painted the whole house. I wanted colour. There are three shades of yellow, then light green, deep garnet red, baby blue in the master bathroom, shades of mauve, powder pink and then the blue and pink in the children's rooms and the bold orange in the bathroom. I love colour - I love using it to add warmth and depth; to add a feeling to a room." Jenn describes the way light alters paint colours throughout the day, keeping things fresh : "I love the gold in the living room with the sunlight or the lights on in the evening. It’s such a warming feeling - that’s what's great about having colour - it changes as the day changes." 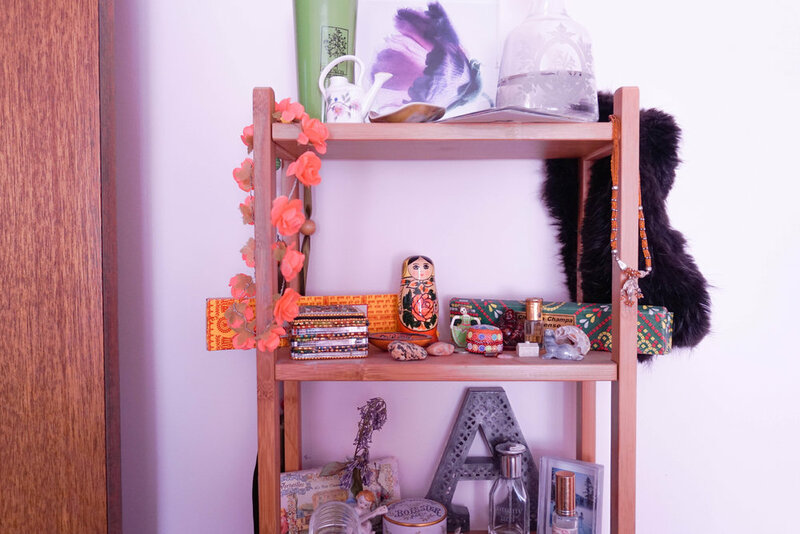 And as colour plays into the vibrancy of the home, so does Jenn's collection of pieces curated and discovered through her travels. How does travel become woven throughout your home? I love that you can bring back a story to tell - someone can stand in front of my pictures and I can say, 'On that day we were on the Rialto bridge and it was 40°C - or that that brick is from Venice’. Bringing those elements home builds a connection to the rest of the world. That your home is this tiny place that's interconnected and not a stand alone microcosm. That and it keeps the travel bug alive in me. What is a favourite item in your home you collected on a trip? The hearts in my room and the hearts from churches in Italy; I saw them in Venice and wanted to find some to bring home. Even though I’m not religious, there's a feeling of reverence and grace in preserving and bringing beautiful elements back into your home. What piece in your home is from the furthest place away? The fabric from Asia and the ladder from France, the hearts are from Venice, it’s hard to say. What feelings do you want your home to evoke? For both you and your guest? I hope when people come in they feel welcome and warm. I love entertaining with family gatherings and so it’s this … my house. I love pulling out my grandmother's silver and the dishes my mom gave me that she had when she first got married, and we’ll have 12 - 16 people all in one room. I don’t want it to feel formal, I want to be comfortable in all those spaces. I look for inspiration wherever I find it. I like what I like and it tends to come together in a pretty organic way. Once you have a sense of style you coincidentally choose similar pieces. For example the deer motifs in the house - there are antlers throughout the house and pieces from local designers that all fit together. I’m very inspired by Italian and French design, in Italy it's the art elements and in France, it’s the etched glass. When did you start collecting mirrors? In the past five years. I’ve always loved them, but once I had my own home and space, it was about gathering these pieces I admire and having the dark part of the mantle contrast to the reflective quality of the glass. The shapes on them, the glass itself - it's these tiny details that are so eye catching. What changes would you like to make in your home? I’d love to reno the kitchen - that’s my biggest, but traveling wins out. Buying and investing in this house was a big choice so I want to find the balance of traveling with home renovations and ownership. I don’t want to sacrifice everything in my life to redo my home, not just yet. Which is your favourite room in the house? I spend most of my time in the kitchen and family room, it’s an easy comfortable place. During the holidays it’s all about the living room with everyone playing music, but the family room is for curling up with a blanket, and during the summer we take advantage of the back yard. What is your philosophy when adding something to your home? I like to invest in pieces. If you get something good quality it’s going to last forever. Ikea things just don’t last. When I got divorced and was on my own I vowed I wasn’t going to go the Ikea route - I wanted things that were long lasting and meant something to me. I wanted intentional pieces versus just filling space. Consequently the living room was empty for a couple of years before it was set up, but it was well worth the wait. Do you follow any design rules? Nope! I have no design rules. I had a lot of things when I moved into this house so in terms of things, it was more about what I wanted - I picked the deer chair because I loved it with the linen that tied in with the rug and wanted the space to flow. I like a home that has a flow of colour or design or themes that work together. It’s too hulking to have really different pieces in every room. I’m naturally drawn to botanicals, deer - you know what you like so you need to trust that instinct versus buying something because you feel obligated. It has to be your own style or else it will come off contrived. I love that expression in a house. Being comfortable in the space - if you go into any kitchen you should look at it, open up the drawers and find the things you need. There’s this flow in a house that if you let it, makes sense. You work with the style of house to create that flow and having beautiful things that tell a story really contributes to that. I think a house is a home when someone can open up cupboards and be at ease in the space wherever in the home that is. It’s those things that tell a story and gathering them with intention. Carpet Family room - Calgary, and ones in the front are from Ikea. Coal Scuttle - Ordered online from a shop in the United States I found through pinterest. Light Fixtures are all original, towel rack original, and hung in original places on all the outside corners. The Holidays are the perfect excuse to indulge in this ritual; the art of gift giving, time honoured and born from a place of affection. Small tokens of appreciation that have the ability to say so much in a simple gesture - yet the question of what can oft be perplexing. 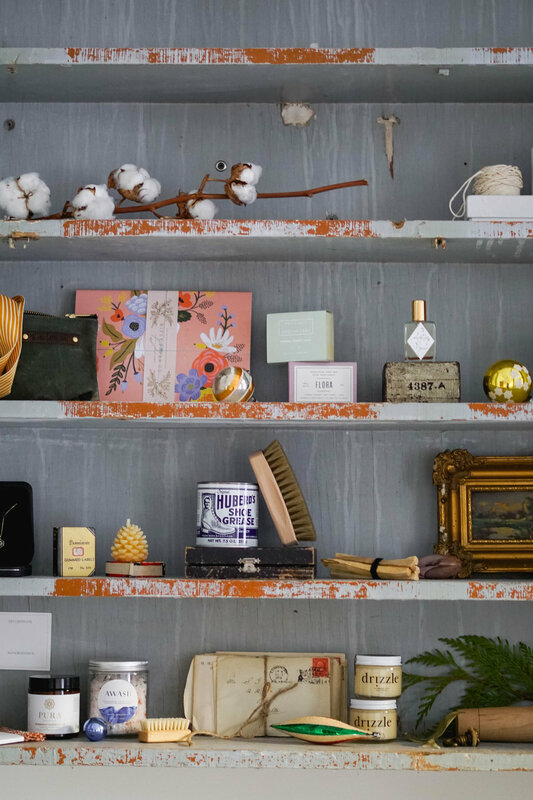 At the core of our little shop and subsequently this journal, we want to adorn homes with things of meaning. To be treasured and passed down. To be used and lived in. 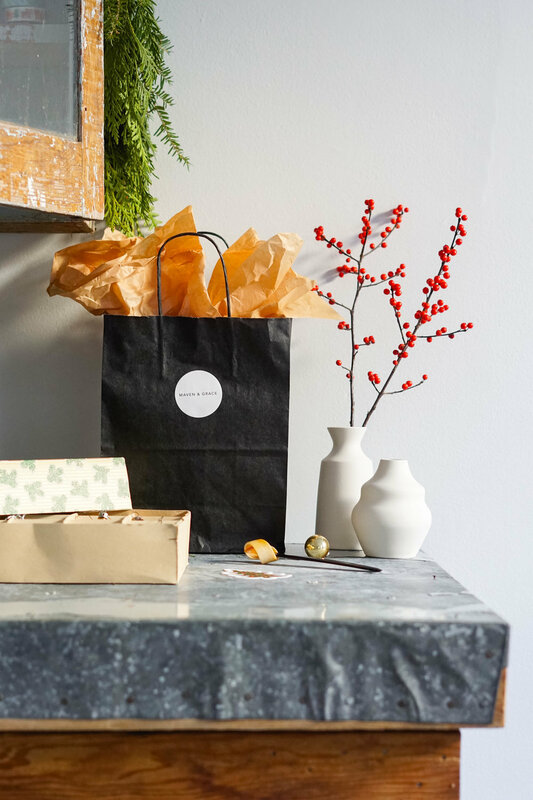 And so as we built this year's gift guide we chose pieces that delighted us, encouraged slow living and were simply downright useful. We hope this helps inspire your purchases and sparks ideas for those on your list. We sincerely hope these guides help you during this bustling season. For more inspiration find last years gift guide here or simply stop by the shop! We are open with extended hours during the Holidays and we hope to see you soon!